Steak bites are a favorite among my family! 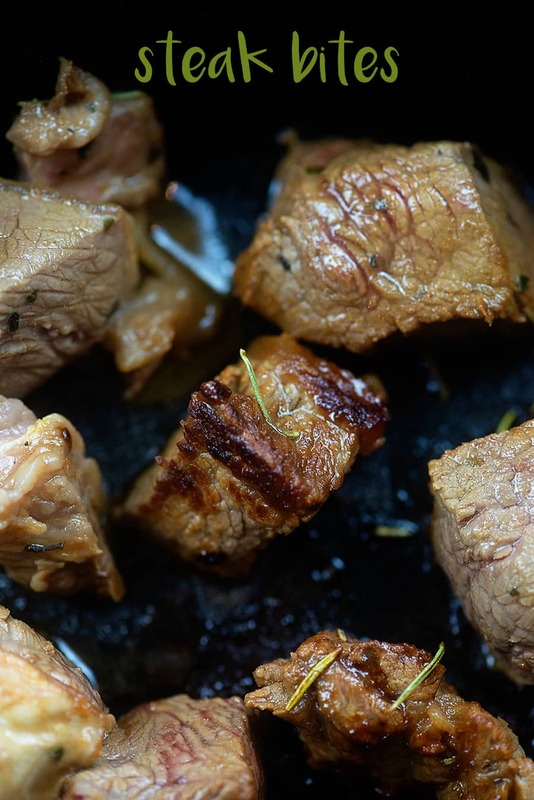 I love that the marinade really soaks in to the little bite-sized chunks of steak and we all love how quick these are to get from stove to table! The other night I had the biggest craving for a big hunk of meat. I just needed some red meat in my life, like immediately. There isn’t much in this world tastier than a perfectly cooked steak! I love to grill them outside on our big grill, but sometimes I prefer to keep things simple and just cook them right inside on the stove. My trusty cast iron skillet makes a fabulous steak! Often, when I’m short on time for marinading my steak, I turn to steak bites. 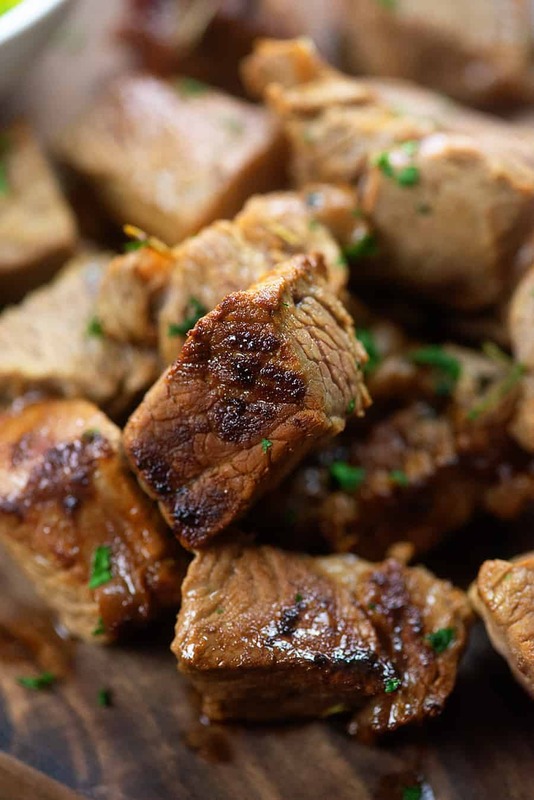 Everyone just LOVES this little steak bites recipe. It’s beyond simple, but it’s just a major crowd pleaser. I start with my easy steak marinade. Add some hot water to a mixing bowl and dissolve in a tablespoon of salt. I know that it feels like an awful lot of salt, but I like my steak to have some flavor and it starts with a bit of salt. Keep in mind that we’re discarding the majority of the marinade, so you’re not actually consuming as much of the salt as you’d think! Once the salt is pretty well dissolved in the hot water, stir in some vegetable oil, vinegar, Worcestershire sauce, mustard, hot sauce, oregano, rosemary, and pepper. It sounds like a laundry list of ingredients, but I’d bet you have most of those in your kitchen right now. This marinade is seriously just my favorite!! Whisk it all together and it’s ready for your steak! I’m starting with a couple of New York Strips, but you can use any cut that you enjoy for this recipe. Slice the steaks into bite-sized chunks and then add them to the marinade. 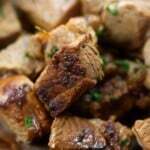 Because we’re using small pieces of meat, the steak doesn’t need to marinate nearly as long. Thirty minutes in the marinade is fine, but 3-4 hours is AMAZING. 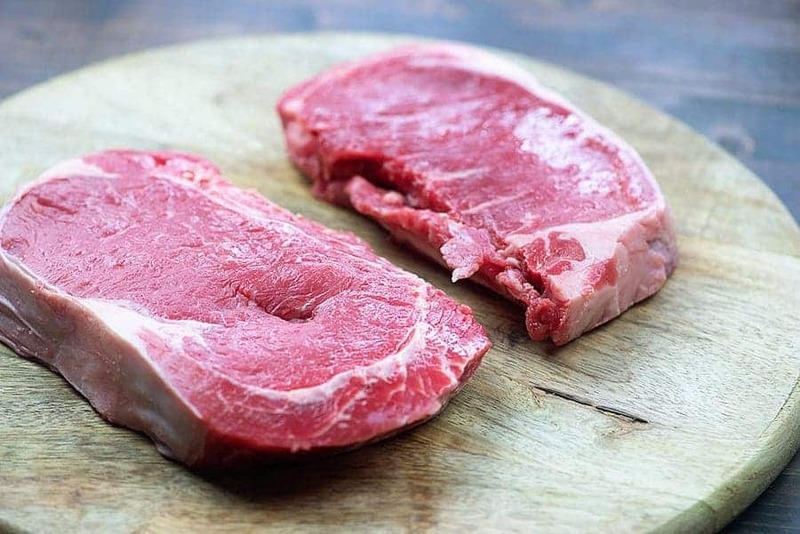 Don’t leave your steak in much longer than 8 hours or it does start to get a bit salty. Drain off the marinade and pat the steak bites dry. 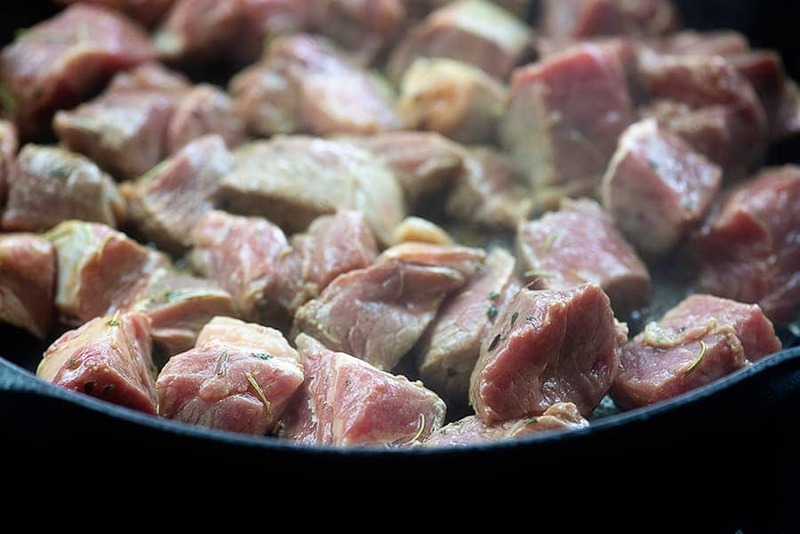 Heat a cast iron skillet as hot as you can get it and toss the steak bites right in. Let the steak bites cook, stirring occasionally, until all the pieces are browned on the outside and cooked to your liking in the center. These go so quick, especially if you’re more of a ‘rare’ type of person. Keep an eye out so you don’t over cook your steak! I like to melt together some butter, garlic, garlic powder, and parsley to make a simple garlic butter for dipping. Broccoli Cheese Casserole is another delicious side that my kids gobble up. Loaded Cauliflower Casserole is my go-to when I’m missing potatoes and want something that feels a little more indulgent. 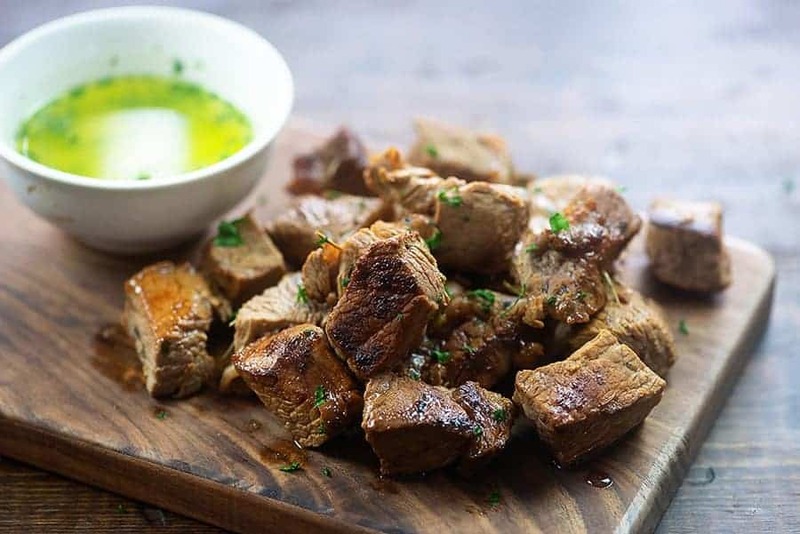 So flavorful and juicy, these steak bites are always a hit in my house! Dice the steak into bite-sized pieces and place into a zip top bag. Whisk together the hot water and salt until the salt is nearly dissolved. Add the remaining ingredients and whisk well. Pour the marinade over the steak. Seal the bag and marinate for 30 minutes to 8 hours. When ready to cook, heat a cast iron skillet over high heat with a tablespoon of oil. Drain the marinade from the steak and pat the steak bites dry. Add to the hot skillet and cook, stirring occasionally, until browned on all sides and cooked to your liking. To make the garlic butter, melt the butter in a small bowl and whisk in the minced garlic, garlic salt, and parsley. 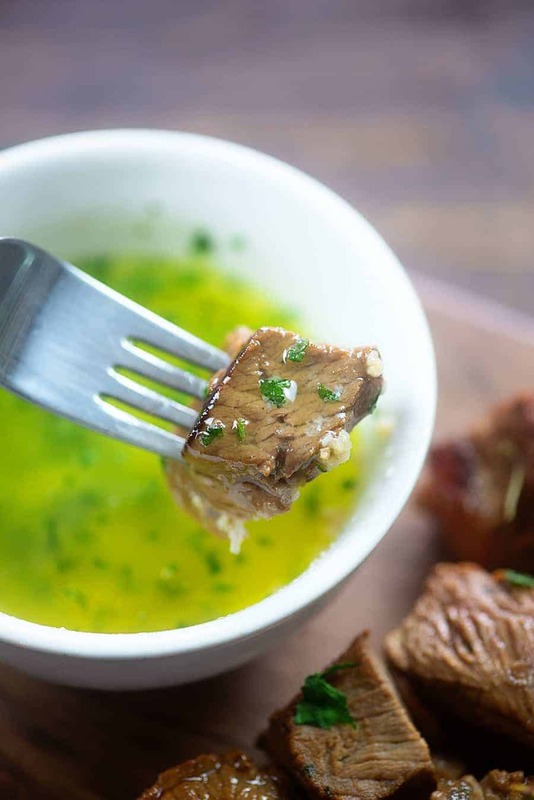 Serve garlic butter with the steak for dipping. what can you substitute Vegetable oil with for marinade? I don’t even like steak typically, but these are amazing! Definitely do NOT skip the garlic butter for dipping! Thanks for sharing! I will be making these again asap! Did you use dried herbs or fresh? Where can you get the measure utensils you used, the little jar looking ones? Loved the recipe! Can this be made in a non stick skillet instead of cast iron? It can, but you won’t get as nice of a sear on the steak. Loved the marinades ease but it was way to salty for me, granted thats my families own pallet talking. Will definately try it again with maybe only a teaspoon of salt. Thanks for sharing. Sounds lovely, but could you please confirm what type of mustard? Is that American mustard? Thanks. I made these the other night. AmAAAAAzing! I love it when I hear words like “Excellent” and “Beautiful” when I serve dinner! 🙂 The only thing that I changed was I used beef broth instead of water (and reduced the salt a little) in the marinade, and I used tarragon instead of parsley in the garlic butter. I buy whole beef tenderloin and cut it into steaks–this is a great way to use up that little end! Can I substitute vinegar with balsamic, because balsamic and Worcestershire sauce it’s delicious together. I haven’t tried it, but if you like the flavors I’m sure it would work here. Made this tonight! Absolutely delicious. Thanks for a new go-to steak recipe. My family loved the “tips” style steak with the dip. 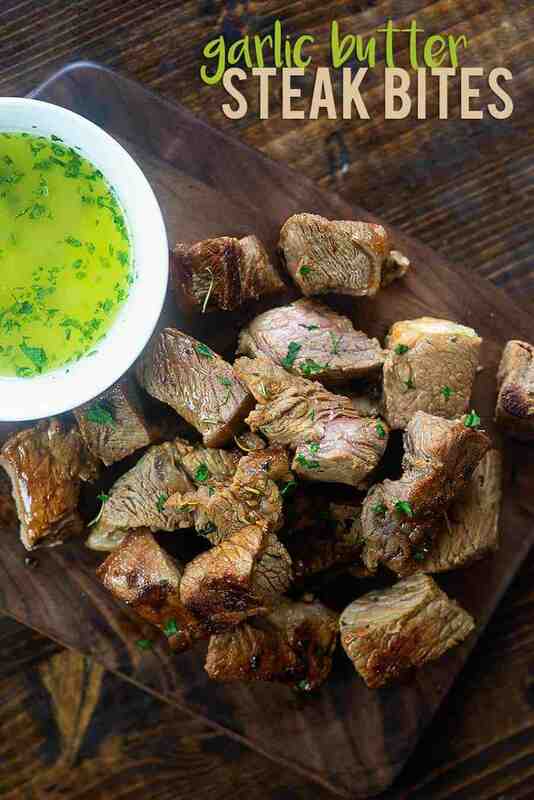 what do you consider a serving with this recipe , since it’s steak bites? thank you! This was soooooo delicious! I didn’t have veg. oil so used Tsang’s stir fry cooking oil (0 carbs) for the marinade and cooked it in olive oil. Didn’t have white vinegar so used balsamic. Didn’t have rosemary so used thyme. The steak bites were in the marinade for about 5 hours and I cooked it in my dutch oven on the stove top (I don’t have a cast iron pan). I’ll definitely be making this again.